Deathrock, New Wave and Post-Punk elements intertwine and play off each other to create an air of familiarity that will cross generational divides within the scene. The last labor of The Spiritual Bat is a sequence of flash-backs and flash-forwards of the last few years, the story of how journeys came to be, the story of how songs were born, from the scream of an Artist caught into a mortal mechanism, a machine that would signify the death of Art, and therefore the end of Spirit. 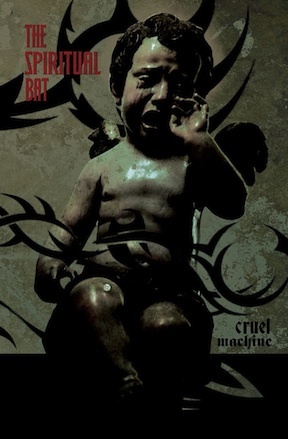 Cruel Machine, the album, is the synthesis of an emotional journey through micro and macro cosmos, in which each song itself is a ritual journey inwards and outwards. Cruel Machine, the song, is the scream of an Artist, a Realist, yet a Visionary craving to steal time from the Cruel Machine, craving to be Spirit through musical instruments, because in the Spiritual World would lie an evolution, the illusion of touching eternity while feeling as nothing but stardust. Limited, hand-numbered edition of 300 copies. Packaged in a deluxe 6″ x 9″ folder including an 8.5″ x 11″ poster.